The majority of amateur footballers want a choice on whether they have to play matches on Easter weekend, a Club Website poll has revealed. 59 percent of people said that they did not think teams should be forced to play football on Easter weekend, while 41 percent said it should be treated as per any other weekend. With Easter providing a double Bank Holiday weekend and falling in the school holidays, many people choose to take advantage of the time off and go away for the weekend, which can leave many football teams struggling for numbers. As a result, many people think that the holiday weekend should be treated differently as far as amateur football fixtures are concerned. 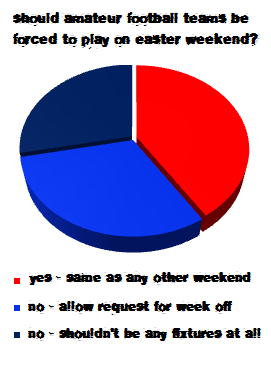 31 percent of poll respondents believed that teams should be allowed to request a week off from their regular fixtures, whilst 28 percent believe that there should not be any fixtures scheduled at all. What do you think about the results of our latest poll? Did your team have a load of players missing on Easter weekend? Should we just leave it as a blank weekend across the country? Or should teams just be better organised? Tell us what you think in our comments section below. Should amateur football teams be forced to play on Easter Weekend?